You need to look at the details then. The doubler shown seems to be correct, but that photo also shows an incorrect exhaust hanger. Wouldn't it be better to show the *correct* exhaust hanger, or no hangar at all? Here are two photos showing what I mean. 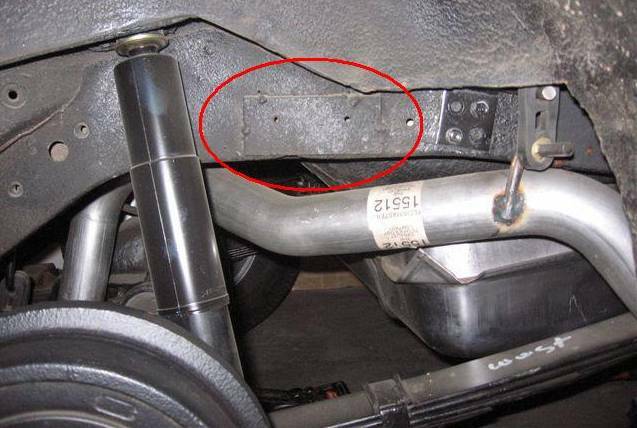 The existence of the factory doubler on the LH rear frame rail only indicates that dual exhaust were installed from the factory .. ie.. Z28, and SS and COPO I would imagine. That plate wasn't used in 67 or 68. For those two years they used threaded inserts. The plate was a 69 only thing. However, even if the car has the inserts, it only proves it came with dual exhaust, which was optional on both the LF7 and the L30. If it doesn't have the inserts, the car came with single exhaust which was standard on both the LF7 and the L30. I added the pic of the 68 RS backup light hole. Thanks Victor! The doubler shown seems to be correct, but that photo also shows an incorrect exhaust hanger. Those pics have been there for 3-4 years. The pic of the doubler show the whole wheelwell, so someone knows where to look.